Smith Family Farm offers Vermont all natural beef, pork, whole chickens, lamb, and eggs from pastured hens. Our walk-in freezer enables us to keep a good supply of meats on hand. Individual cuts are available in the farm store open Monday-Saturday from 9-5, or by appointment. Orders for a variety of beef, pork and chicken packages are taken year around and filled on a first-come first-served basis. See meat package options. Smith Family Farm raises Hereford and Angus-Hereford cross cattle, breeds that thrive on a primarily all-grass diet and are well suited to Vermont winters. One of the first farms to practice intensive rotational grazing in Vermont, the herd is moved onto fresh pasture on a daily basis to ensure that they have access to abundant nutrient-rich forage during the growing season. We produce our own hay and corn, and during the winter months feed hay, haylage and corn silage. Smith Family Farm does not feed animal by-products, growth hormones, steroids, antibiotics or artificial additives of any kind. 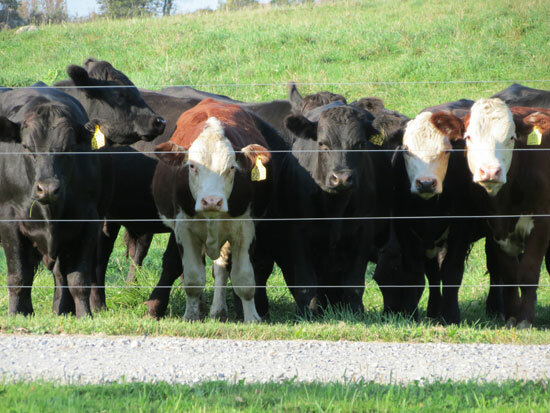 Our cattle are humanely raised and locally processed at a USDA/Vermont-inspected facility. Most of our meats are cryovaced to ensure that they stay fresher longer. Smith Family Farm beef is available frozen, in bulk or by the cut. We offer pre-ordered custom-cut whole- and half-beef packages, a variety of specialty beef packages, and individual cuts available in our farm store. From our own sows, we raise 12 or more piglets a year. The former dairy barn has been renovated into pens where we house our pigs, feeding them a mixed diet of vegetables and grains—free of antibiotics and artificial hormones. Our pigs are locally processed at a USDA/Vermont-inspected facility. Most of our pork is cryovaced (ground pork and sausage can come in plastic sleeves), and is available by the whole or half pig, as specialty pork packages, or by the cut in our farm store. We’ve been told our maple sugar cured hickory smoked bacon is out of this world! A limited amount of pasture-raised lamb, free of antibiotics and growth hormones. Whole and half animals are offered, as well as retail cuts in the farm store, as available. Smith Family Farm raises and sells whole chickens, averaging 4-6 lbs. each, priced at $3.50 per lb. Chickens are processed on the farm in a mobile processing unit. Frozen chickens are available in the farm store while supplies last, or by pre-ordering. Let us know the number of birds you’d like and we’ll be happy to grow them for you, at the approximate size you prefer. Fresh eggs are available in the farm store. Eggs are collected, washed, quality-checked, boxed and refrigerated daily. Smith Family Farm is committed to producing healthy, high quality meats at affordable prices. We stand behind our products and guarantee the quality of our meats. Five percent of our profits are given back in support of youth programs and organizations in the New Haven and Middlebury communities.